My wife and I are headed to Utopia at 6:15 in the morning. And that’s from Indianapolis, so it’s definitely going to be a short night. Actually, I hope to go to bed pretty soon. I found a very nice blog post this afternoon by the mother of one of Tyler’s friend’s. It’s over at MarineCorpsMoms.com. I’m the skinny chump on the right, that’s Tyler in the middle facing the camera with the big eyes and thrilled look! The other two boys are my nephews Craig and Eric (LeAnn’s sons), now they’re both maybe, oh, about twice my height. 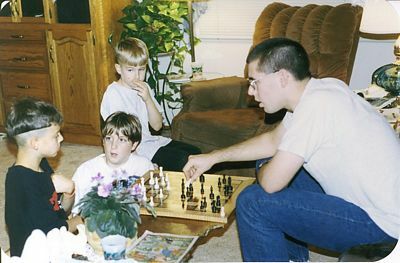 I don’t remember this particular time, but I’d give a lot to play that game of chess again. LeAnn also mentioned that today she was finally able to write a blog post about Tyler. I could hardly read it through the tears, yet I couldn’t do anything else either until I had slowly and thoroughly gone over it twice. She wrote a very touching, moving tribute to a nephew she loved, complete with some great stories and anecdotes from Tyler’s life. My brother Galen just emailed me that latest article from the hometown newspaper (Albany Democrat-Herald) about my nephew Tyler Troyer. Here’s the link: Family, friends honor Marine. It tells about the ceremony they held at Tyler’s high school this morning. I found a couple of pictures online. 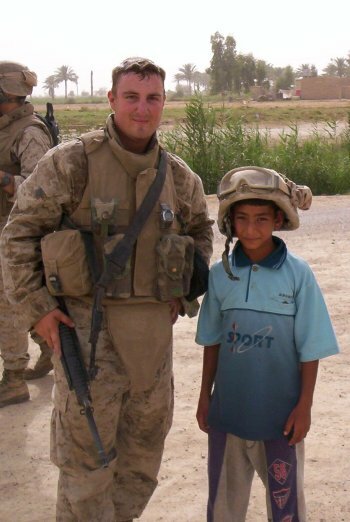 Tyler with an Iraqi child. 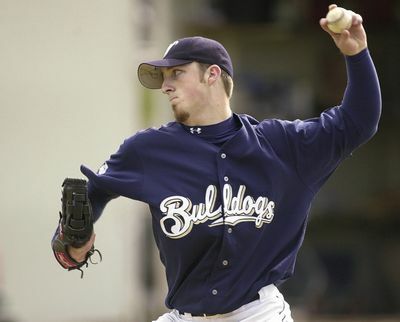 Here’s Tyler on the mound. Gov. Kulongoski asked that flags at public institutions fly at half-staff today in memory of Tyler. My wife and I are planning on flying out to Oregon next week, I’m in the process of getting airline tickets. Happy Birthday to my wife! Tonight I’m taking her out to Olive Garden. That’s where we had our first ever date. I’ll have to tell you what I’m giving her for a birthday present. Update: Oops. Ran out of time. So we’re going to Pizza Hut. Not quite the same, but I’ll take her to Olive Garden later! Here are some more news links about Tyler that I’ve found on Google News. His Family — a long article from the Oregonian. My wife and I are trying to make arrangements to fly to OR, but it’s tough. We don’t know yet for sure if we’ll be able to make it or not. Thank you very much for all your encouraging comments and emails. I wrote this Saturday night. Since I have lots of siblings, it stands to reason I would have a bunch of nieces and nephews. In fact, they started coming along before I did! But I was old enough to remember the last few siblings getting married, and later I was even called into service as a babysitter from time to time. I remember when my nephew Tyler was born. It didn’t take long to realize that this kid was a live wire to end all live wires! He would tear around full-tilt, hollering at the top of his lungs, wearing everyone else out long before himself! After a few years had passed, I really didn’t get to see him all that much anymore. But he did mellow out as he grew up! I remember him visiting and riding along with me down to Jerry’s to pick up motorcycle parts. I remember him wanting a ride in my Camaro not long after I got it. So we hopped in and took off. I saw him even less as time went on. He played baseball in high school and he loved it. He was a pitcher. I played a little PE-credit baseball in college at around the same time, so we had a conversation or two discussing the game. I was house-sitting for my sister for a few weeks one summer, and he happened to be living next door at the time. I knew he was joining the Marines, and one afternoon he came out and caught me and told me he was leaving that day or the next. I gave him a hug and we said good-bye. He thought about driving up to my wedding last summer (I forget where he was stationed at the time) along with his girlfriend, but it didn’t work out. I was disappointed, I would have liked to introduce him to Jewel, and besides, I hadn’t seen him since that day before he left to join the Marines. He had served in the States for quite a while, but a few weeks after the wedding he was sent to Iraq. His Dad occasionally emailed us updates on Tyler and what he was doing. He even sent a couple of pictures just a month or two ago. I thought, man, I’ve got to send him a note! Earlier this week Dave had sent me another update and I kept it in my inbox to remind me to drop him a line. Of course I hadn’t done it yet though. Tonight Dave called and told me that today Tyler was killed in Iraq. I laid down for awhile and cried. I’m still crying. 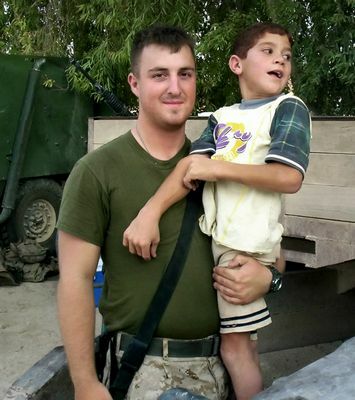 Link to news articles: Oregon Marine Killed in Iraq (KGW), article in the Oregonian, KATU Article. This is really interesting. Somehow I (mistakenly, I’m sure) received an email newsletter called “Things Hutterite,” from a Tarrel “Terry” Miller. I don’t know much about Hutterites. They live in colonies and hold all things communal, to my understanding, and I think have some ties to very conservative Mennonite/Amish. I saw that Hutterite movie once, “How to get to Heaven in Montana.” The thing I remember was being astounded at how a large segment of them completely disregarded salvation! Very strange. This newsletter doesn’t have a very formal “news” feel. Rather, it comes across as speculative and gossipy, hinting at possible situations in certain colonies, theorizing about various and sundry hidden meanings, and reading in between the lines. Then they take on Peter Hoover! I don’t know Peter Hoover, but I’ve heard stories about what a charismatic and interesting man he must be. I believe he has written quite a bit also (he authored Secret of the Strength). Evidently the last few years he’s turned Hutterite. Unless I’m getting a lot of things mixed up. Anyway, half of this newsletter is taken up with a rant spent ripping on Pete! It’s quite astounding, to me anyway, and pretty much gets rid of any credibility or self-respect the newsletter might have had in the first place. Very odd. I know next to nothing about Pete, I don’t have any idea if the criticism is justified or not, but I’m really surprised that this kind of a thing would get sent out to (I assume) a good-sized group of people as an official newsletter. On and on he goes at poor Peter’s expense. I sure wonder how I became the recipient of this. I’ve joked about having a big Amish following here on ITF, do you suppose there’s also a Hutterite one?! Well, I was right, it was a long day but we survived. My wife and Anita drove all the way home while I slept. I was wasted. We arrived after 2 a.m.
We saw lots of Utopian friends and relatives, that was nice. At the beginning of the reception the top three-fourths of AHQ realized they were present and that they knew a love song as a trio. So come open mic, we marched up and warbled away on “Battleship of Love.” That was fun. My wife and I served as servers at the reception. We were to quickly eat at the beginning, and as I sat down at a table this dude across from me said something to the effect of “Well if it isn’t Mr. Iced Tea Forever!” I of course had no clue who he was, but quickly found out it was Eugene Friesen. We had emailed before and I had been to his blog, so it was nice to make the personal acquaintance. And don’t forget, Eugene, you need to email me that link! I will say, however, that I’m beginning to have a bone to pick with my good buddy Hans. Eugene admitted that he didn’t come around to ITF as much anymore, instead choosing to spend his time at MennoDiscuss!! Oh the disgrace!! This cannot go unrectified! I’m about to declare a full-scale assault on MD. I’m formulating a post addressing this issue head-on, look for an upcoming official recommendation from ITF. David and Beth were the duet vocalists at the wedding and Abigail and Rachel played piano and flute. Very nice, they did a great job. Of special mention was “The Rose.” It can be pretty tricky to come up with really good duet harmony, but they knocked this one out of the park. Wow. They did some great stack changes and lead swaps and a few other things that really made this one a joy to behold. Anyway, I’m still beat. And this week at the Den of Iniquity is looking even worse than the last. Who knows when you’ll hear from me next, but never forget that you’re in my constant thoughts and benevolent wishes. Talked to my good buddy By for a while on Monday night, found out I get to see him tomorrow. My formerly Utopian bud Brendan is getting married at UB in Plain City, Ohio. My wife and I along with a few others are driving out in the morning for the wedding. We’ll come back in the evening, so that’s good. It will be a long day but I should be able to handle it. For that matter, it’s been an extremely long week but I’ve handled it. Barely.